Reflecting on the 70s trend from our recent post…we compiled a few prints that capture the essence of the bright, fun, and groovy decade. We found that funky abstract florals, bold geo’s, and psychedelic colorways are the perfect mix to accurately represent this rising trend in textiles! See the rest of our 70s inspired collection! This entry was posted on Thursday, September 30th, 2010 at 3:10 pm	and is filed under Prints, Trends, Vintage. You can follow any comments to this entry through the RSS 2.0 feed. You can leave a comment, or trackback from your own site. 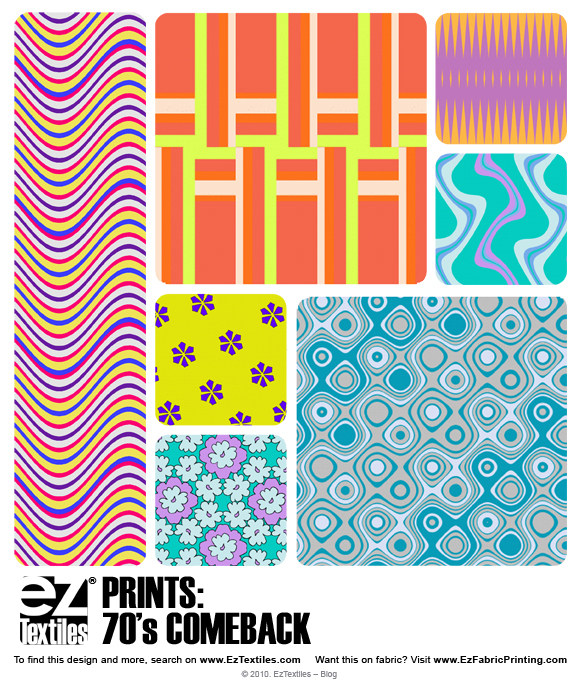 This is totally retro 70’s..I was looking around your site for patterns just like these, and you just made my day!